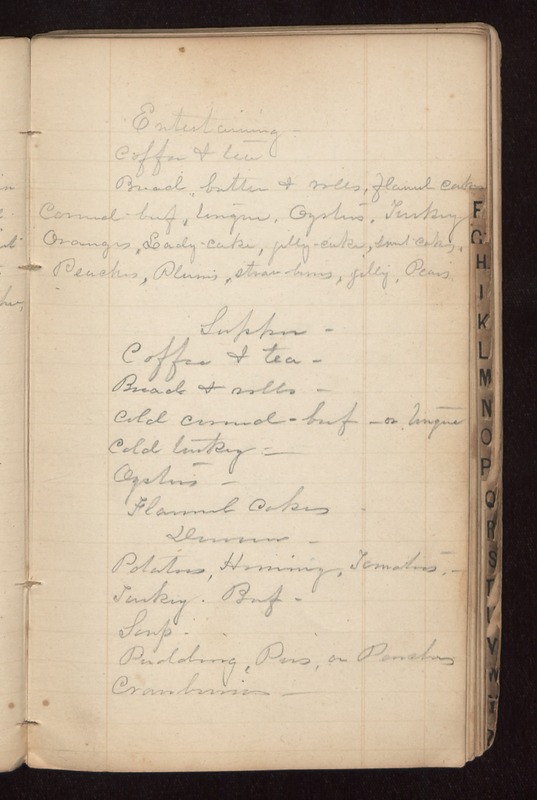 Entertaining Coffee & tea Bread butter and rolls, flannel cakes Corned beef, tongue, Oysters, Turkey Oranges, Lady-cake, jelly-cake, sweet-cakes, Peaches, Plums, strawberries, jelly, Pears Supper- Coffee & tea. Bread & rolls. Cold corned-beef or tongue Cold turkey Oysters Flannel cakes Dinner Potatoes, Hominy, Tomatoes, Turkey, Beef, Soup Pudding, Pies, or [Peaches?] Cranberries.